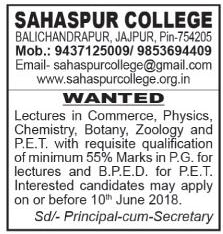 Sahaspur College, Jajpur has advertised in SAMBAD newspaper for the recruitment of Lecturers jobs vacancies. Interested and eligible job aspirants are requested to apply with in 10th June 2018. Check out further more details below. About College: Sahaspurcollege is situated in the heart of diamond triangle at Balichandrapur in the district of Jajpur, very adjacent to the NH 5 (A) landing from Chandikhole to Paradip. The place which has a rich cultural heritage Ratnagiri. Great cultural masters like SanthaArakhita Das, ParsuramBihari, Artist B.Burma, BirupaMohanty sultriest peoplespoel - BaisnabPani&Pallikabi Nanda Kishore Bal were burn in this area & made great spiritual & cultural & literary contributions to the life of Odisha.